The Microburst 9000 is the best choice air freshener for cost control, while still providing powerful long-lasting odor protection. 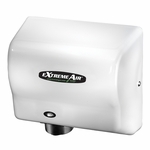 With the Microburst 9000, Technical Concepts is providing three times the fragrance and odor control in a dispenser that is half the size of a typical air freshener. The Microburst 9000 emits a fine dry mist that contains 63% less VOCs per spray than a normal aerosol. The dispenser has an easy-to-use LED control which can be set to spray every 7, 14, or 28 minutes. The more advanced Microburst 9000 LCD dispensers can be programmed to spray for either 12 or 24 hours a day and either 5, 6, or 7 days a week.